Things. We all have them. It’s impossible to poke along through life without them. Some people have a plethora of things. These folks could be referred to as pack rats or hoarders. On the other hand, some people lack things and could easily fit everything they own into a bag or back pack. Some people only accumulate things that correlate with a hobby they enjoy pursing. While other people may have a collection of things. Regardless, we all need things. I earned my PhD in accumulating things in my teenage years. I was a natural! As the siblings moved out, I found good usage of the items they left behind. Although, living in a Victorian two-story home made acquiring things super easy. Because we had so many rooms and so much space, it felt oddly strange to have the bare necessities for each room. So, every space was filled with something, and then some. Not only were the rooms furnished but the walls couldn’t be naked for long either. Closets were chuck full of clothing for every different seasonal occasion and along with the accessories. And, who can forget about the garage full of all tools imaginable for both interior and exterior maintenance and chores. Needless to say, when we started down the path of how we got here, we had a tremendous amount of purging to do. Admittedly, I had a terrible habit of not letting things go, especially things that had sentimental value to me. I figured I wasn’t the only person on this planet who had a rough time unloading clutter from their life. So, I turned to our local library to look for information that would help me learn how to relinquish my things from my possession. One of the favorite books I’ve read was Clutter Busting: Letting Go of What’s Holding you back. A more current and popular version is The Life-Changing Magic of Tidying Up. However, it’s currently on my list of books to read. I applied what I learned from the books I read and attacked the kitchen first. Our kitchen had beautiful cupboards that were a few feet above the countertops that went up to the ceiling. Not to mention the cupboards underneath the counters and the pull out drawers. These spacious dormitories were completely chuck full with unused (or used only once) kitchen items and gadgets. Rubbermaid storage totes were scattered all throughout the kitchen. Such items and gadgets were removed from its native hiding spot from within the cupboard (or drawer) placed in the middle of the kitchen, to be packed up and stored away. The endless supply of dish towels were graciously used to wrap breakable dishes and glass wear with. Starting on another room (because that is what you do when you’ve started something for half a second and move onto something else), at some point for some reason I frivolously walked into the kitchen; and, stumbled across Adam standing there with a perplexed look on his handsome face. One hand held something and the other bewildered upon his hip. His bottom jaw partly hung open, as it appeared as though it would be an absolute struggle to connect it with his upper jaw. Concerned, I asked, what was wrong. His eyes stopped frantically moving from side to side and slowly met mine. As you can imagine, a cat caught his tongue. It took a bit before I realized that he was extremely overwhelmed with all of this. Once we got past the beginning phases of The Purge we found a rhythm that was a bit easier to handle. 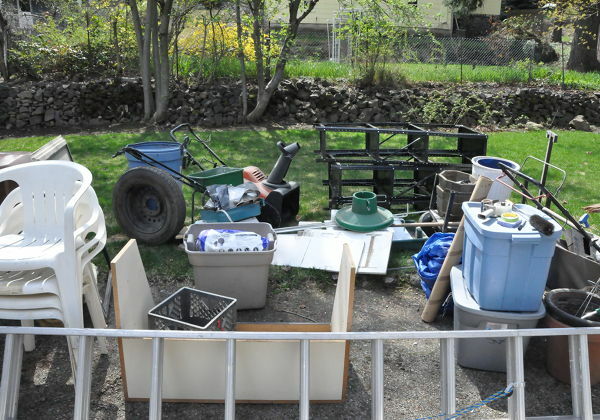 Donation and throwing things away were quickly incorporated into the process. We tried to sell some things too, but our minds were really focused on moving, so we did not sell as much as we would have liked to. Needless to say, we had a successful move and we were off. To the downsized home. A couple of years after our moved, a cyclical nagging reminder continued to pop up every now and again. It kept telling me that I wasn’t quiet done with The Purge, yet. Extra rooms, and a portion of the basement, housed rows of rubber boxes full of unpacked things. I couldn’t help but think if I haven’t unpacked it to use by now, than I most likely don’t need it. Like the slow and steady tortoise I continued to eliminate the things that were holding us back in life. Yep. Garbage. The garbage sale wasn’t quiet the hit I was hoping it would be, but it did get rid of some clutter. The remainder of the things have magically disappeared. You’d have to ask Adam. Have you gone through a Purge? If so, tell us about it. Sarah and I are going through The Purge a bit now, before we take off on our 6-month RV trip. It’s not as extreme as yours– we’re not selling our house, only renting it out, but I can relate to how overwhelming the whole process can be! No doubt its a daunting task. I remember feeling dazed and constantly thinking to myself “how in the world did we acquire so much stuff”. I’m still amazed at my ability to acquire stuff. 🙂 Hope you and Sarah found your rhythm with purging and its a smooth-ish process for you guys! Where is the first place you guys are stopping at when you hit the open road?